It was a little late in the game for a properly matured marinade, but I figured with meat this nice it would hardly matter. 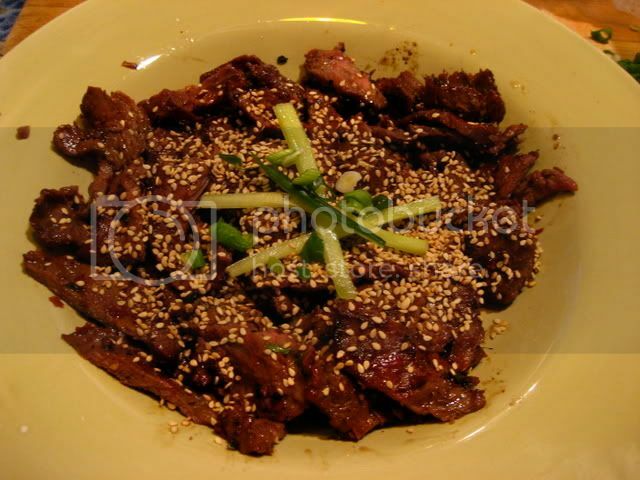 I gave the pound and a quarter of meat two hours in: half a cup shoyu, two tablespoons sugar, four minced garlic cloves, three minced spring onions, a splash of sesame oil, two cranks on the black pepper grinder, and a healthy sprinkle of chile flakes. After a neighborhood wide search for lump hardwood charcoal, I surprisingly scored at K-mart, which also had a not-bad selection of hardwood for smoking needs. I whipped up a kimchi tofu salad and cold sesame soba noodles (buried in garnish) for a bright and refreshing early summer's eve supper. The meat was melt-in-your-mouth tender, smoky charred, just the best. Rolled in shiso leaves, which provided a crisp and herbal counterpoint to the meat, this was a simple, yet sophisticated (and cheap- the meat was 6.49 per lb.!) meal that wowed my people. Oh boy oh boy! Good looking meat, nice looking finished product! Don't know about shiso leaves--what are they, what do they taste like? Awfully nice pix, too. Tnx for taking time off from cooking/eating to share them with us. Just beautiful - I see the shiso leaves around and am also curious about them; they look like they'll hold up a bit better than the more often used red lettuce. 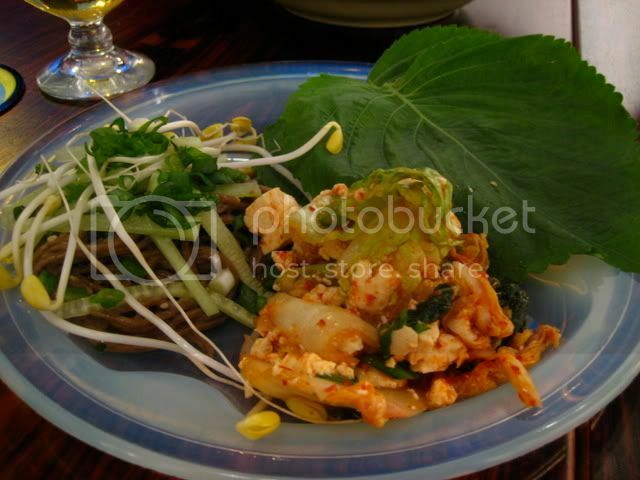 Geo wrote: Don't know about shiso leaves--what are they, what do they taste like? Shiso or Perilla http://en.wikipedia.org/wiki/Perilla is an herb popular in Asian cuisines, most often used fresh, even as a green vegetable. It has a flavor profile somewhere between the mentholated qualities of mint and the rounded soapiness (in a good way) of cilantro. 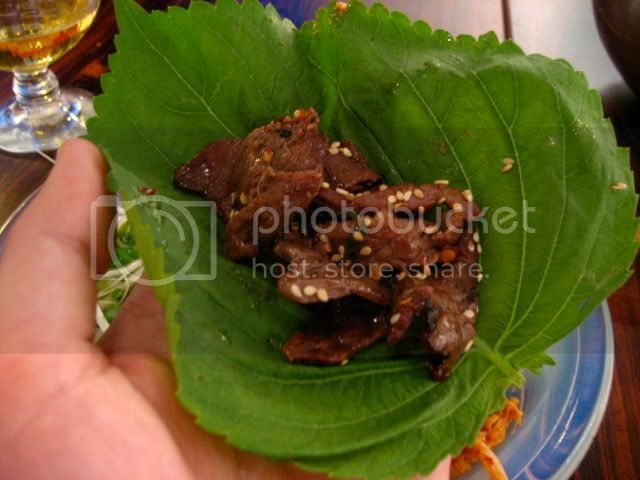 I am most familiar with its uses in Japanese and Korean cuisines as a wrap for meats, fish, and rice, nit unlike the use of lettuce for similar purposes. Mhays wrote: I see the shiso leaves around and am also curious about them; they look like they'll hold up a bit better than the more often used red lettuce. They do indeed have a more sturdy structure than leaf lettuce and are also incredibly more interesting, flavorwise. I have had Korean BBQ wrapped in both shiso and lettuce. 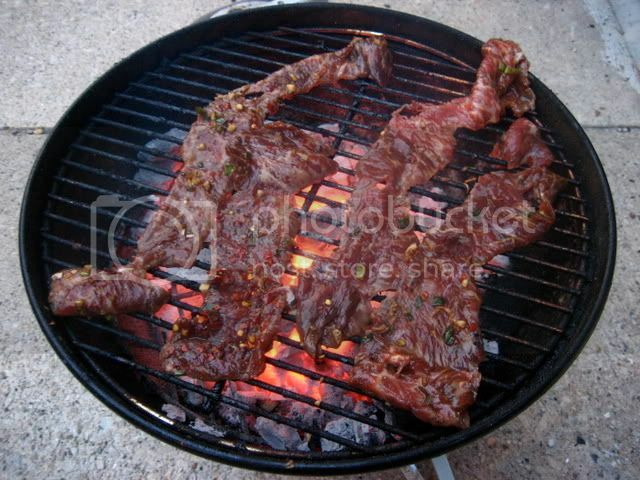 Jefe wrote: What I stumbled across was heavenly marbleized kalbi, boneless, sliced thin, and rolled into neat little bundles. 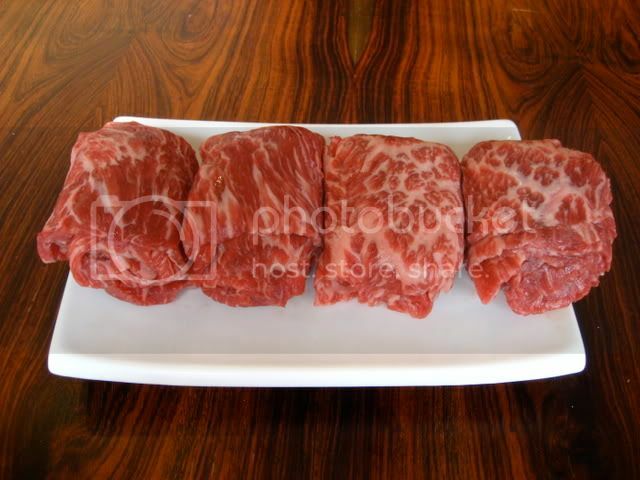 Looks terrific, in particular the marbled beef and shiso leaves. As Steve Z mentions Short Rib and Scallion rice at UrbanBelly was so delectable we both picked up kalbi at Joong Boo (Chicago Food Corp) to make for dinner. In the past I have rolled my own, but Mike Sula highly recommended the premarinated kalbi from the butcher counter so I went Sandra Lee. Veg and panchan from Joong Boo, kimchee from New Chicago Kimchee. Sliced scallions were dressed with sea salt and sesame oil. Kalbi was served with panchan, sliced daikon radish, grilled red pepper drizzled with sesame oil, scallion w/sea salt and sesame oil, kimchee, leaf lettuce and short grain brown rice. 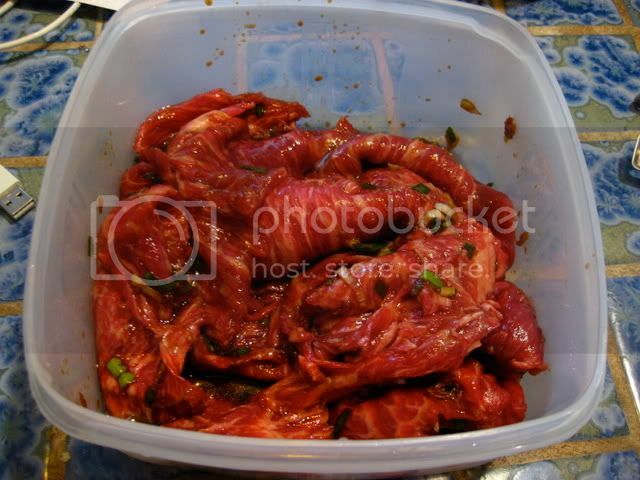 Premarinaded kalbi hit the spot, just a nickle shy of my homemade version or current favorite Korean BBQ joint Hai Woon Dae. I'd say Wow, but that will make the drool run out of my mouth...beautiful, G.